If you’re looking for a new pair of wireless earbuds, your search definitely just ended. The Mpow Flame Bluetooth In-Ear Headphones have been best-sellers on Amazon forever. 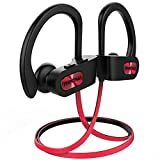 They feature fantastic sound quality, great battery life, IPX7 water-resistance, and a shockingly low price that’s typically around $22 or $23. But if you pick up a pair before January 11th and use the exclusive coupon code BGR008AR, you’ll get them at a new all-time low of just $15.99!